Bob Moyer is prowling the mean streets again. THE SENTRY. By Robert Crais. Putnam. 320 pages. $26.95. For most of his life between the pages, Robert Crais’ Joe Pike has played a terse Tonto to Elvis Coles’ loose-lipped Lone Ranger. Joe has a symbiotic albeit secondary relationship — Elvis detects, Joe protects. Until now. For the second book in a row, Joe has stepped into the spotlight, a spotlight that turns him into a hero much like Lee Childs’ Jack Reacher – stoic, self-possessed and relentless. He can stand still for hours, slow his pulse and his breathing. Then, when he moves into action, he can “stack bodies like cordwood.” He hasn’t shown any weakness. Until now. Stopping for gas in Venice, Calif., he notices a couple of gang bangers headed into a café. Since his momma never taught him not to trouble trouble if trouble wasn’t troubling him, Pike breaks up what looks like a shakedown. Then the owner’s niece Dru walks in, and it’s eye lock at first sight. Pike promises to protect her without knowing a thing about her. And, as they say, that’s that. What Pike doesn’t know but his buddy Cole uncovers is that Dru has a lot to hide, including herself. She and her supposed uncle are the targets of the creepiest killer Crais has ever come up with, a psycho we first see at book’s opening torturing a man in New Orleans while Katrina bears down. The deceptive duo also has two FBI agents and two L.A. cops on its case, all of whom find Pike just plain annoying. Suddenly, after one phone call, the couple drops out of sight. As Pike’s hopes for a happy relationship plummet, the body count rises. Crais knows L.A. backwards and forwards, up Ross MacDonald’s beach communities and down Raymond Chandler’s mean streets. Venice Beach comes alive here, teeming with violence and vile characters, one of them almost as alert and lethal as Pike. 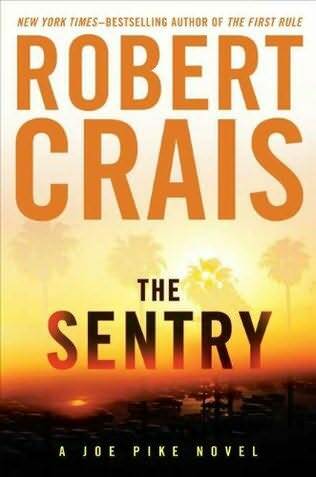 The operative word is “almost”; Pike is not among the body count, but The Sentry is among the best of Crais’ books. This entry was posted in Mysteries, Thriller/Suspense and tagged Robert Crais. Bookmark the permalink.